This was a hard book to read, mainly because of the subject matter. Cancer is one of those things that you know exists in the world, however, we think that we are invincible and it will never impact us. That is not the case for Tess’ sister Kristina. She’s the perfect daughter, popular, athletic and into boys and makeup and Tess’ mom prefers her over Tess. Nobody notices Tess at school and she is the outcast. Everything changes when Tess’ family discovers that Kristina has cancer. Tess begins to be noticed at school, but not for the right reasons. Everyone is talking to her because they want to find out the latest on Kristina’s cancer and how she is doing. It all starts to be too much and Tess can’t handle it. I found Tess’, Jeremy’s and Nick’s characters the most relatable and developed. We didn’t really get a chance to really know Kristina beyond the surface. The twist towards the end was shocking and I wasn’t expecting it. It was like ‘wow, did that just really happen’? The book definitely impacted my mood for a few days and made me really think about what kind of world we live in. Janet Gurtler tackles the story line really well and it feels realistic. This is my second book by this author and she is going on my auto-read list. Her writing style grabs at you and your feelings, it makes you look at the world in a different way. There is no sugar coating in any of her books and she tells it like it is, what you do with it is a different story. Although this was a difficult read, I will be re-reading it sometime in the future. Sometimes when you re-read books, you tend to find out more and see things more clearly from when you originally read it. 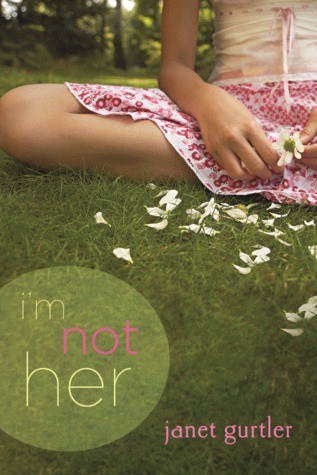 Categories: Book Reviews | Tags: cancer, goodreads, high school, i'm not her, janet gurtler, sourcebooks fire | Permalink. Can Kate Morgan stand up for herself—without being labeled a snitch? On the first day of school Kate Morgan and everyone else in her school are attracted to the side building of their school. It has been ‘tagged’ with a life-size graffiti mural. From that day on, the debates begin whether it’s vandalism or actual art, and the suspense keeps on building on who could be culprit. Is it someone from school? Someone’s friend? A random person causing trouble? Kate wants nothing to do with the speculation, mainly because her father is a cop, and she doesn’t want to be labeled a snitch. When the murals start to appear all over the state, her curiosity gets the best of her, especially when Eli, her favorite coworker goes missing, and she starts to investigate. It doesn’t help that her best friend Lan is busy with her own life, and she can’t ask for her advice. Like why she is starting to see Eli as more than just a classmate and favorite coworker. When the signs begin to point to a culprit, Kate is afraid it might be someone who she is close to and doesn’t know what to do. Personal Thoughts: This book was a big downer for me. What I mean by that is that it wasn’t that exciting and there wasn’t much to the storyline. I’ve had this book on my shelf for the past year and haven’t had a chance to read it because of my really long to read list, but after reading other books by Mara Purnhagen, I decided to bump this one up and read it. The plot line was intriguing don’t get me wrong, however, I think the pacing was off. It seemed as though the plot just dragged on and on. The cover did not interest me at all. It could have had a lot more potential and grab the reader’s attention. They could have had the gorilla on the front cover, even if it was just a small one. I don’t think this cover really works for this novel. I feel as though some parts of the story could have been extended (such as Eli and Kate, Lan and Bradley, etc). It seems as though something is missing. There is no wow factor that makes you think about the book or pause and think it over. Overall it was a quick read but a disappointing one, because I was expecting more. 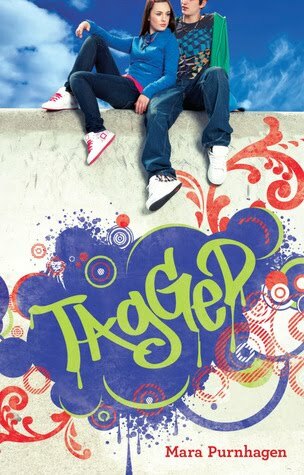 Categories: Book Reviews | Tags: art, graffiti, high school, mara purnhagen, mystery, tagged | Permalink. Lauren has a good life: she has decent marks, great friends and a great boyfriend. She has been with Dave, her boyfriend for a while now and everything is perfect. Everyone loves him, he’s popular, good looking, on the football team. She should feel lucky to have such a guy who wants to be with her.Then why is she so unhappy? What’s wrong with her? It takes the arrival of Evan Kirland to really discover what has been worng in her life. He shows her that she’s been holding back and staying with Dave out of loyalty. She feels safe with Dave, she knows what to expect when she is around him. Being with Dave is the ‘right’ thing to do. Why would anyone leave such a perfect relationship? As things start to get more complicated for Lauren, she realizes that she needs to make a choice and soon. Or a choice will be made for her. I loved the simple green cover and the emphasis of the daisy. It’s a great connection from the flower to the word itself, bloom. What really captured my attention first was the background of Lauren’s life and how she was brought up. The constant struggle within herself brought out my sympathy and made me want to comfort her. I loved how the author delved deeper into the secondary characters and gave us, the reader, a chance to see their life. Lauren and Dave were great characters although the way that their relationship was described, it kept making me think of the 1950s. Back then you could be with someone even though both parties weren’t exactly happy to be with the other, or were just content and lived on their lives. The struggles that Lauren kept having within herself whenever she was with Dave showed us a real look within. The complexities surrounding Lauren and Evan were great. I loved the way they initially met and then years down the road it happened again. The hint of danger and of something happening when it shouldn’t keeps the intrigue throughout the book. The author’s writing style was wonderful in the scenes when they were together. You could just tell that they had eyes only for each other. Overall, this book has a good story plot and the pace is just right. You keep wanting to know what will happen and keep turning the pages. I enjoyed this first delve into Elizabeth Scott’s book and will be taking a closer look at her other books. 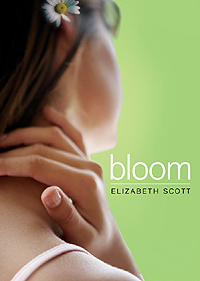 Categories: Book Reviews | Tags: bloom, elizabeth scott, friendship, high school, love, YA | Permalink. Lily has left a notebook at her favorite bookstore full of challenges for the right guy to come and do them. Is Dash the right guy? Or are they just playing a game of cat and chase, sending the other to another mysterious location with a clue. Can their in person encounter be anything like the characters on the written page? Let us find out. I found this book to be written uniquely. The various clues that were left for either Dash or Lily and the clever way that each found their respective clues made me admire them. I don’t think I would have done as well as them had I been put in their shoes. Although, who knows how well or how poorly I would do unless I did it myself? I loved how Dash was all moody and mysterious and full of hate for Christmas, while Lily was the exact opposite. She made him go and sit on Santa’s lap! A 16 year old boy on Santa’s lap! I was laughing when I read that part. 🙂 This book was a great scavenger hunt at a time and place where it’s easy to get lost. I’ve been to New York around Christmas time and I know exactly how crowded and chaotic it can get around Christmas time. Lily and Dash are a pair of characters. One thing that the authors did that I really liked was how they made the secondary characters be as active as the protagonists. In doing that, it felt like I knew each and every one of them by the end of the book. Some more, and some less. 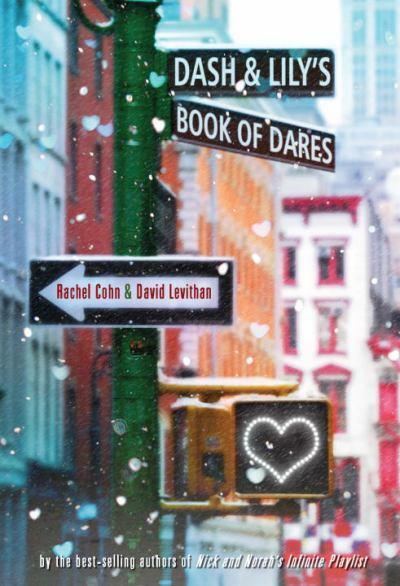 Categories: Book Reviews | Tags: dash and lily's book of dares, david levithan, high school, new york, rachel cohn, romance, scavenger hunt, times square, YA | Permalink.